B) Blank cover sheet plus suggested comments - as outlined below - that can be edited according to your wishes and desires (lazy option!). Email the completed form to to Airquality@environment.gov.au by April 17, 2015. For detailed information, see the Consultation document "Working towards a National Clean Air Agreement"
NB: The NCC and Envirojustice spoke to the Federal Department running the process - they stressed the importance of having lots of community submissions. No. The aim is too vague. It should be to implement all cost-effective measures to achieve an optimal sustained reduction in air pollution and exposure for all Australians, with associated health, environmental and economic benefits. If asbestos had not yet been banned, would it be acceptable just to reduce its use, rather than eliminate this serious health hazard? The proposed goal is unacceptable because it fails to distinguish between what is best for the community as a whole (including economic impacts) and smaller reductions in pollution that might be favoured by profit-driven industries. The principles should focus on the task – to generate overall community benefits – instead of the procedures. Costly disruptions from policy changes are undesirable, but so are the health costs of air pollution. If asbestos were still permitted, what would be an appropriate lead in time for phasing it out? Regulations and requirements should aim to strike a balance between the cost of action and the cost of delays. Suggested changed (including reordering) are shown below. The resources allocated to all identified issues should be in proportion to estimated net benefits, in accordance with principle 2 above. It would be helpful to produce an updated version of Table 1 in the discussion document, including estimates of health costs such as the $20-24 billion health costs of domestic wood smoke. NSW Chief Medical Officer Kerry Chant says wood heaters are so detrimental to health she supported banning and phasing them out in built-up urban areas This shows that a comprehensive woodsmoke policy should be top priority. A National Clean Air Agreement should aim to achieve the greatest health and economic benefits. The current "standard" for wood heaters was set by a committee without a single health expert - we don't know if the estimated $20 to $24 billion health cost of wood heater emissions was even discussed. Even worse, the wood heating industry was able to veto any changes to that standard that it did not like. A new heater satisfying this so-called "standard" will emit more PM2.5 per year than 1,000 passenger cars. New heaters that satisfy all proposed standards until 2019 have been observed emitting pollution at the levels shown (right) for many hours. Given the $20 to $24 billion health cost of woodsmoke, finding a solution to this major problem should be top priority, until all current wood heaters have been removed and a new health-based standard has been developed that reduces PM2.5 and other emissions by at least 99%. Avoid inefficiencies of repetition. A National Clean Air Agreement should aim to avoid the current inefficiencies of repetition when all states have to consider the same issue and carry out separate benefit-cost analyses and regulatory impact statements (RIS). The Agreement should allow the Commonwealth to carry out a single benefit-cost analysis and RIS for clean air legislation that applies to all states. Correct the deficiencies in the NPI. The National Pollutant Inventory (NPI) is an essential part of the framework provided by the Commonwealth Government, but its utility is hampered by resource limitations. For example, PM2.5 are considered the most health-hazardous pollutant. The NSW EPA inventory lists 31,744 tonnes of PM2.5 emitted to the NSW Greater Metropolitan Airshed (GMA), but the NPI lists only 3,919 tonnes (12% of the NSW EPA’s total) of PM2.5 emissions to the same airshed. If the NPI is to live up to its name, and serve as a comprehensive, national inventory, it needs adequate resources. The present situation of ignoring 88% of emissions of the most health-hazardous air pollutant in a major urban population centre is a false economy that should be corrected as soon as possible. Avoid unnecessary delays. Implementing the pollution-control measures with greater benefits than costs (identified in the NEPM documents, plus the $20 to $24 billion of savings from woodsmoke control) would reduce average PM2.5 pollution to less than 6 μg/m3 and so save 700 lives per year - woodsmoke.3sc.net/nepc. Delays implementing the NEPM are delaying the implementation of these measures and costing many lives per year. Streamline Regulatory Impact Assessments. Regulatory Impact Statements are to determine whether benefits exceed costs. 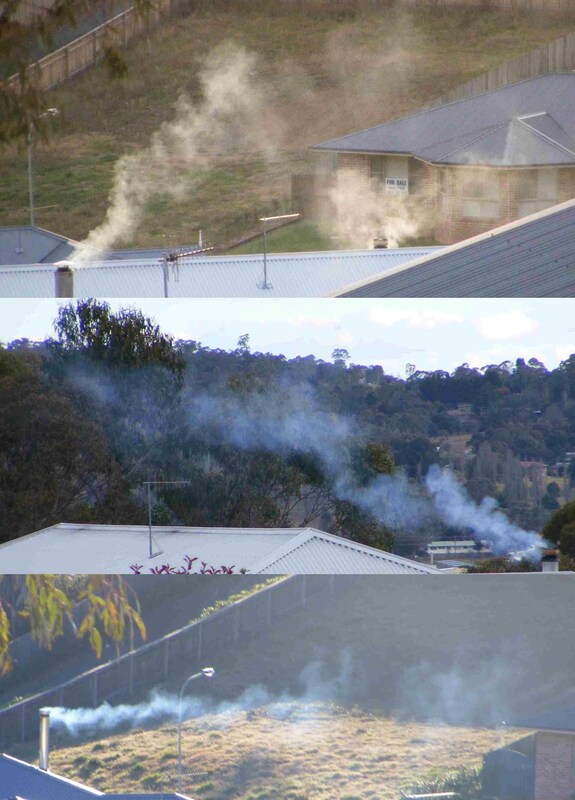 In many cases, the evaluations conducted for the NEPM, or as part of the NSW woodsmoke control options evaluation should be sufficient to proceed with legislation. When, as in Appendix 1, the benefit is over 100 times the cost – e.g. phasing out wood heaters when houses are sold is estimated to save $4 billion in health damage for a cost of just $32 million. With net benefits of over $12 billion for the whole of Australia, further delays would cause significant costs but no benefits. Identify and remedy the causes of previous delays and inefficiencies. One of the most significant failures of the regulatory process is the failure to manage wood heater emissions which, as shown by the NSW Air Emissions Community Web tool (top right column) account for more than half of all PM2.5 emissions in Sydney. Despite this, the Federal Government’s Wood-heater Consultation Regulation Impact Statement (CRIS) did not even consider whether new wood heaters that emit more PM2.5 per year than 1,000 petrol cars should be allowed. The problem is that there is no effective standard for wood heaters. New heaters that satisfy all standards required until 2019 have been observed emitting pollution at the levels shown in the photos for many hours. Yet the proposed Commonwealth wood heater decision RIS "will reflect the new Standards for wood heater efficiency (AS/NZS 4012:2014) and emissions (AS/NZS 4013:2014) developed by Standards Australia in 2014". This “standard” was set by a committee that did not include a single health expert and there is no evidence it even discussed the estimated $20 to $24 billion health cost of wood heater emissions. Even worse, the wood heating industry was able to veto any changes to that standard that it did not like. This is no more sensible than allowing the tobacco companies to set policies on the health effects of cigarette smoking. Because of these problems, a higher proportion of submissions on the CRIS favoured banning wood heaters in urban areas than any of the options considered in the CRIS. A more flexible cost-benefit analysis showing total costs of woodsmoke pollution under each option, enabling full and transparent consideration of the costs and benefits, could have greatly assisted the decision process and perhaps saved time, effort and damage to health. Future protocols should therefore calculate and report the cost of all options, instead of the difference between them, to facilitate public understanding of such important issues. Essential partnerships identified in the consultation document. 2) $8.88 million in funding for a clean air and urban landscapes hub to support environmental quality in urban areas. An effective partnership with the clean air hub could be one way to provide essential public education on the sources and health effects of urban air pollution and the most effective ways to combat it. Other essential partnerships. The Standards Australia process allows industry to veto any proposed changes. It is therefore no more suitable for setting health standards than one that allows the tobacco industry to veto changes to policies on cigarette smoking. The current “standard” for wood heaters was set by a committee that did not have a single health expert amongst its membership and there is no evidence that it even discussed the estimated $20 to $24 billion health cost of wood heater emissions. The Federal Government should therefore introduce a moratorium on the installation of wood heaters until a new health-based standard had been set by independent experts. Partnerships with health experts who are capable of reviewing the costs and benefits of polluting appliances, and developing appropriate policies, should therefore be an essential part of the National Clean Air Agreement. The public supported new Australian standards that added $980 to a $40,000 diesel SUV, but was estimated to save “more than $1.5 billion in public health expenditure over the next 20 years” - see “Car pollution crackdown will save lives but comes at a cost”. Yet even before the introduction of the new standards, pollution from new diesel SUV was nothing like the emissions shown above, of brand new heaters satisfying the current Australian standard; all except the chimney in the top left picture also known to satisfy the standard proposed until 2019. More research is needed into whether people understand with the scientific study results that show woodsmoke is at least as harmful as PM2.5 pollution from other sources, and how to provide better information to allow the public to make informed decisions.